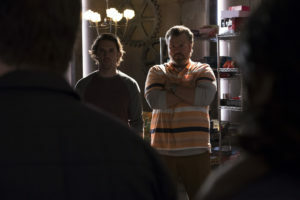 Airing at 10PM Tuesday nights on ABC, Kevin (Probably) Saves The World is one of the underrated gems of the current TV landscape, starring Jason Ritter as a young man tasked with the holy mission of finding 35 other righteous souls. So far, with the help of friends, family and a celestial being named Yvette, the series has taken this likeable lead on a journey to find these souls and save the world. The show comes from Executive Producers Michele Fazekas and Tara Butters of Agent Carter fame. Ten years ago, Reaper was one of the underrated gems of The CW network’s landscape, starring Bret Harrison as a young man tasked with catching escaped souls from Hell for the Devil. With the help of friends, family, and a DMV demon named Gladys, Reaper took its likeable lead on an all-too-short journey to find those souls. The show came from Executive Producer Michele Fazekas and Tara Butters of Agent Carter fame. KSITETV’s CRAIG BYRNE: What is it going to take for Kevin to make Tyler less angry with him? 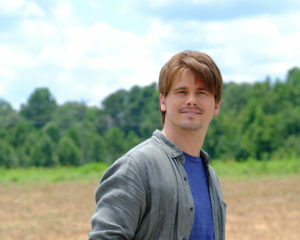 JASON RITTER: Well, that is the question that is most important to Kevin as well. He actually has a hard time concentrating on anything else while Tyler is that upset with him. Considering Tyler’s general incredibly good nature, I don’t think he ever thought that he could ever be angry with him. I think it’s another time where Kevin realizes that he has taken someone for granted, and I think a big challenge for him is that he doesn’t really know how to apologize yet. He’s had a couple of opportunities here and there, but he’s apologized for things that he’s done a long time ago; never a fresh mistake. 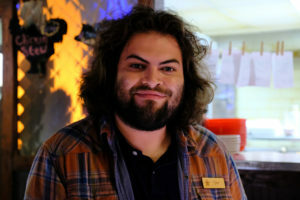 So, in the next couple of episodes he’s trying to do what he feels the universe wants him to do, and simultaneously uses all of his free time to figure out how to win Tyler back. 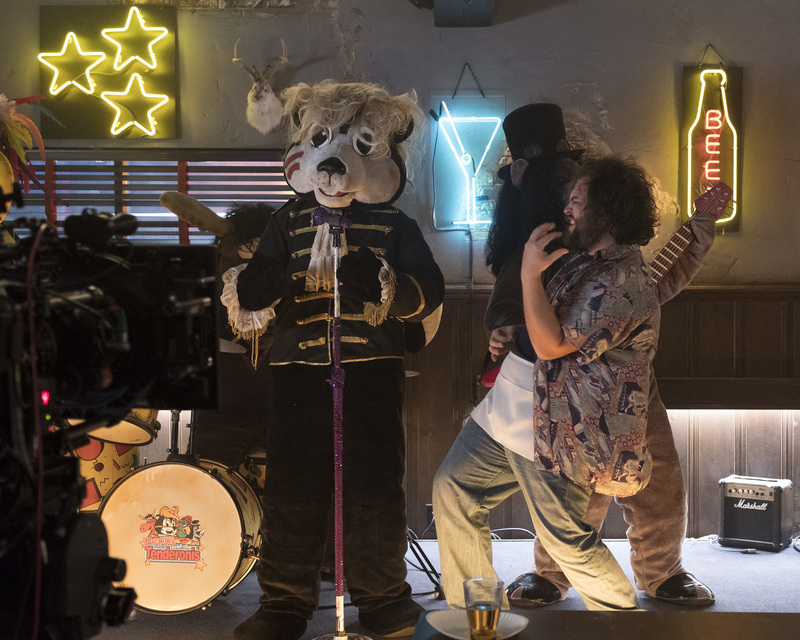 One thing I’ve wondered since watching the Kevin Probably pilot, and considering the guest stars this week, is if the “Tyler” character was named as a tribute by the writers to the actor that played Sock on Reaper, Tyler Labine. Do you know if that was the case? I wonder that! I’ve never actually asked Tara or Michele that, but when we had that episode, all of a sudden I was like “wait a second!” [Laughs] You never know. Writers have all different reasons for naming people, but I don’t know. I don’t think that’s too far of a reach to go “here’s this character, let’s name him Tyler for now just because we can envision this certain type of guy,” and then it just stuck, and now that’s Tyler forever. Or it could have just been an homage to their friend Tyler! Who knows. What can you say about this sort of crossover/revival that we’re getting with Sam and Sock in this week’s episode? For Reaper fans, [they will want to] pause and rewind and get out your magnifying glass and scour the background for Reaper clues. The set decorator did an incredible job with their new digs, and there are just so many things. Tyler and Bret were looking around the set, going “oh my gosh! Do you remember this? There’s the ‘get out of Hell free’ card!” and all of these things that are little Easter eggs for Reaper fans. And then I think for people who have never seen Reaper, they’ll probably be intrigued to go back and watch it, because those two are so fun, with such a fun dynamic together. It was really fun to have them come back around and re-create those characters. Is Kevin aware of the mission that they are on? No. Not at all. They’re super secretive and distrusting of Kevin when he comes. They don’t even tell him their real names, so Kevin’s completely in the dark as to what’s going on with them. But I don’t know. Now that they occupy the same universe, who knows. Maybe down the line they’ll join forces! Is there any chance that Kevin might think that Sam is one of the Righteous? That is a very good question! I think it’s a possibility. I have no idea! I’ve been so along for the ride… I’ve just been getting these new episodes and just seeing what Tara and Michele come up with. The Reaper one was something that I had no idea was in the works, so anything is possible. A second one or more would be lovely. What can you tell us about a character named Marc that Kevin encounters this week? The universe guides Kevin to this young man who is has basically gone on the road. He’s decided to pack everything into a backpack — a real Jack Kerouac type of guy who just decided to try to make it on his own. Sometimes it’s hard for Kevin to tell if he’s supposed to help someone, or if he’s supposed to give advice to them… what if they’re doing something that is dangerous or anything like that? It’s interesting to actually see Marc’s journey. It’s a much more complicated person than Kevin’s used to helping. Marc asks him to do some illegal things, and [laughs] it’s like “what’s the right answer here?” It’s a particularly confusing one for Kevin, but he gets some help. With Yvette seemingly becoming more human, is that going to pose more challenges in Kevin’s quest to find more righteous people? Yes. That becomes a big deal in these next three episodes, as Yvette and Dave are becoming more human, and they’re all of a sudden susceptible to injury and pain. It also starts affecting them in other ways, and they’re both a little bit panicked about it. That becomes a big thing where Yvette starts to even doubt her ability to protect Kevin. So, yeah. 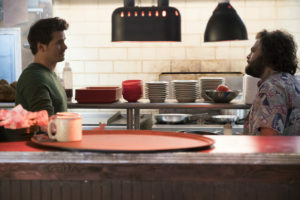 It becomes a crisis for her character as well, and at a certain point she brings in some help in the form of Leslie Jones in the final episode [of the season] which is a really fun cameo. We’re excited for people to see that. What can you say about Leslie Jones’ upcoming guest appearance? She’s also a celestial being; a warrior for God. Like Dave and Yvette, she comes down and — without spoiling too much — it’s a very intense moment in the show. Obviously, Leslie is just so funny and she killed it. We were very happy to have her. Hopefully we’ll have her again — who knows? 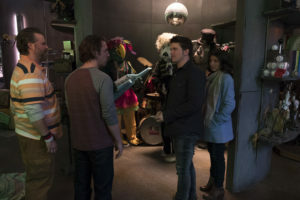 Everyone I know who has seen Kevin (Probably) Saves The World has enjoyed it, so for those who haven’t seen the show yet, how can they catch up? I believe they can go on the ABC website or app. I think Hulu is another place where they can catch up on old episodes. The other option is to go to a friend’s house who has watched it and who has kept all of the episodes on their DVR, and watch it there! My mom is one of those people, so if you happen to be a friend of my mom, go on over to her house! She has all of the episodes on DVR. What would you personally like to see in your show’s future? There’s a massive change that happens at the end of Season 1, so I would be excited to see how the new dynamic ripples through the whole world of the show. And I would just love to see it continue… so far, every idea that I had of how the show would progress and what would happen and how it would all work… it’s all gone differently than I expected, in really wonderful and exciting ways. So with Tara and Michele and the rest of the writers who are all so incredible working on it, I would just be excited to see where it goes. And hopefully, I would love to see Kevin get all 36 righteous people, and then see what happens there…. if that’s the end of the show, or if then there’s a new mission that they all have to go on, or something like that. You know what I would really love to see? This is just my dream: Is that seven years from now or something like that, we’ve done all of it, and we bring back all of the Righteous, including that little baby who played the first one who would now be a little child. I would love to see that kind of thing! But who knows what that child will want to do. I don’t want to force a newborn baby into acting, but I think that would be fun! Kevin (Probably) Saves The World airs Tuesday nights on ABC. Take a look at some preview images for this week’s episode here (including some Reaper cast!) below!